When Olena Shes Metallic, a daughter of Equi-Stat Elite $21 Million Sire Metallic Cat, and Walt Erwin entered the arena from the second draw, the crowd erupted in cat-calls. 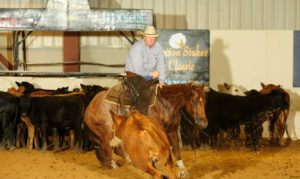 The cheers grew louder as the duo put the moves on their cattle, earning the Cotton Stakes 3-Year-Old Intermediate Open title in a nine-horse field.“It was good! We cut three really good ones,” said Erwin, who had earnings of more than $548,000 going into the Cotton Stakes. “We got a really good grey cow that settled good that Clay Johnson and Gabe Reynolds both liked, and then we cut a black one that was standing on the top. The last one was just a shape cut on the outside to finish the run; it was good, too.”Although Olena Shes Metallic made her futurity debut look easy, it hasn’t always been a clear path ahead for the mare (out of CD Hot Tamolly x CD Olena). As a 2-year-old, she underwent eye surgery, which took her out of training for a three-month period. “That’s why her barn name is ‘One-Eyed Mary,’” Walt said with a chuckle.With her vision fully restored, One-Eyed Mary is making up for lost time. She brought home a check for $6,000 to owner Mark Senn, of Augusta, Georgia, after she and Erwin marked a 221 to top the finals.According to Erwin, the way the mare stops is what sets her apart in the show pen, but she is still learning the ropes. While she’s a good hauler so far, she doesn’t enjoy the actual loading process. “Once you get her in the trailer, she’s fine,” he said. One-Eyed Mary will get a break after her success at the Cotton Stakes. “Her next trip will probably be to the Southern [Cutting Futurity],” Erwin said, noting that he is headed to the All American Quarter Horse Congress without One-Eyed Mary in the trailer this time around.